Longines was so kind to lend us their Legend Diver Date timepiece for a while. This means that I can wear it for a while and our photographer Bert can take his time to shoot some proper photos of the watch. I have a weak spot for vintage watches, but I am not so keen on having them serviced or repaired to often. When you buy a vintage watch, you absolutely need to take into account that it will need an overhaul at some point. Also the fact that not every part might be available anymore is not very attractive to me. When a watchmaker (or factory) is out of parts, it means you are left behind with a watch with ‘issues’. Trust me, I had my share of watches that needed parts that weren’t around anymore. In the end, I got them all repaired or replaced, but in some cases, it took over 12 months. So, I am keen on re-editions of vintage timepieces of certain eras, but it needs to be well executed. Perhaps this also explains why certain watches never changed that much, they are a brand’s key to success. Take the AP Royal Oak ‘Jumbo’ or the Rolex Submariner. However, you can hardly say that these watches are re-editions, as their production has practically never been cancelled. A good example of a well executred re-edition is – in my opinion – the OMEGA Seamaster Ploprof 1200M. 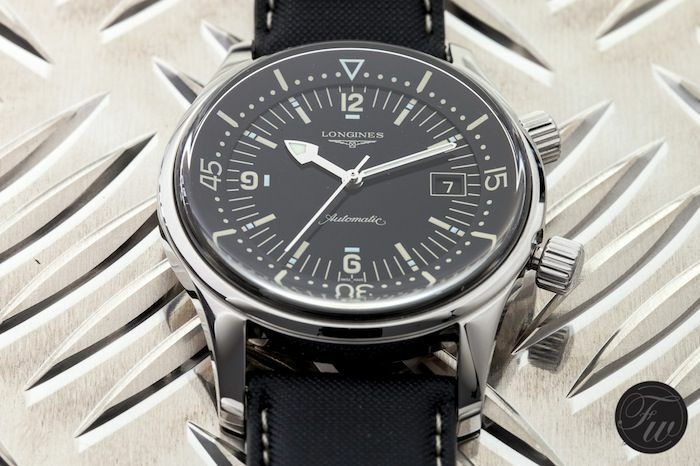 Another example of a well executed re-edition is the Longines Legend Diver. Approximately 50 years ago, Longines had a very similar diver watch, with an automatic caliber 290 Longines movement inside. This 42mm Longines Diver watch had dimensions that are similar to the current Longines Legend Diver watch. Longines did a well job re-desiging this icon from their own heritage. 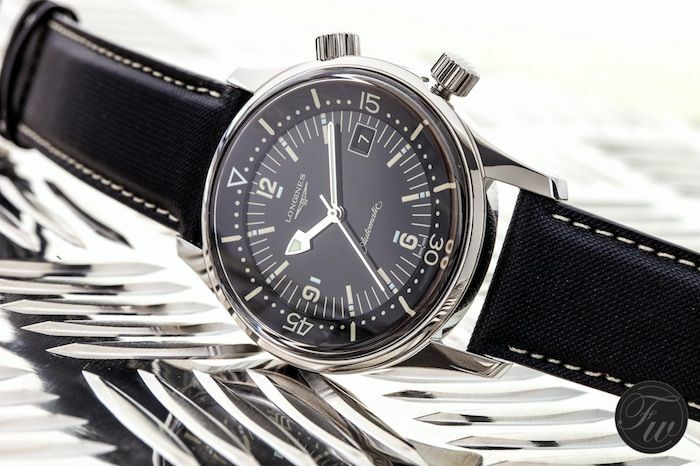 A quick search on eBay tells me that these vintage Longines Diver watches can go easily up to $8,000.- USD (see photo above, captured from eBay). If you are not prepared to pay that or don’t want to take the risk of the things I described above when buying a vintage watch, you can always consider this re-edition Legend Diver by Longines. 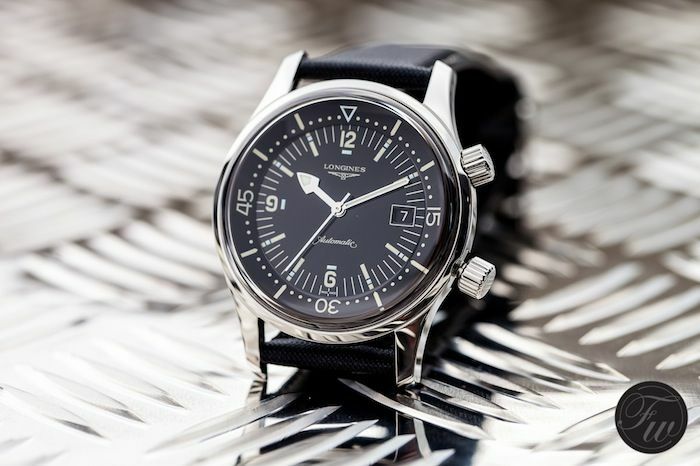 Longines borrowed us the Legend Diver Date model. The Legend Diver was introduced in 2007, without a date feature. In 2009, Longines added a version with a date complication as well. For some reason, Longines decided to stop the production and delivery of this no-Date version in 2011/2012. Personally, I wouldn’t mind the version without the date aperture, as it comes closer to the original and it doesn’t disturb the otherwise clean dial. I did a quick run using the watch consumer behavioural data of Chronolytics, and it seems that 52,45% (world wide) of those looking for a Longines Legend Divers want one without a date (ref. L3.674.4.56). My guess is that there are purists who aim for the no-date version and people who need a bit of ‘practicality’ in a watch and prefer a date feature. A pity that Longines doesn’t want to please both groups. Anyway, let’s move on. The Longines Legend Diver Date has been on my wrist for a couple of weeks and I have to say that is a very comfortable wearer. The 42mm diameter is just perfect and matches the current standard ‘size’ for timepieces. I can only imagine that the original version of this must have been huge in the early 1960s! One of the reasons why it is so comfortable is probably the synthetic strap that comes with the watch. The other side of the synthetic strap has a lining of a felt-like material. This ensures that the watch is easy on the wrist (no sweaty issues) and that it stays put. I can imagine a vintage looking stainless steel mesh bracelet would look cool as well, or a NATO strap made out of leather. The two crowns, (the lower) one for setting time (and date) and (the upper) one for rotating the inner diving bezel. The crowns have the same hobnail pattern as the original Longines Diver watches and are easy to grasp and operate. A (super) compressor case like this Longines Legend Diver one is not that uncommon, as we’ve seen similar ones from Jaeger-LeCoultre for example. In the past, companies like Universal Geneve (Polerouter Sub), LIP (Nautic Ski), Benrus and Fortis have been using them as well. The Longines Legend Diver has a super compressor case. Compressor relates to the seal construction which ensures water resistancy through pressure on the gaskets. Super Compressor is equal to compressor, but also features a screw-down caseback. Some people think super compressor also has something to do with the two crowns, but it doesn’t. More information about (super) compressor cases can be found on the Scuba watch website. On top of the 42mm diameter watch case is a domed sapphire crystal. Although I wouldn’t have mind a plexi crystal on this watch, I can understand the choice for a scratch resistant sapphire crystal. Although most buyers will be so-called desk divers, the watch is capable of handling a pressure of 30 bar (~ 300 meters). 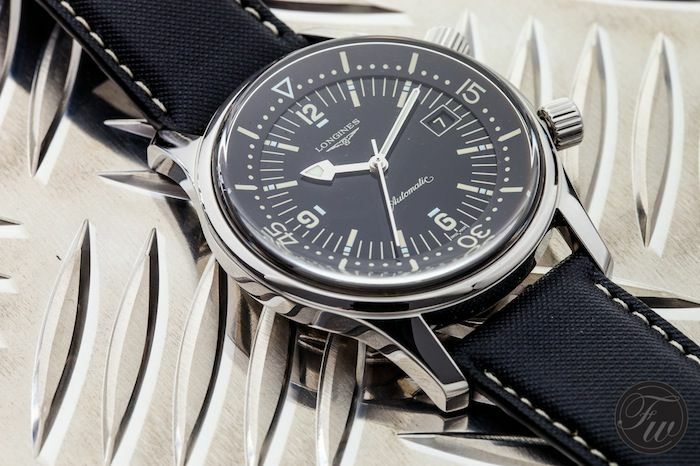 The black lacquered dial of the Longines Legend Diver Date is just beautiful. It was one of the things, together with the super compressor case and two crowns, that makes this watch. The painted luminous (Super Luminova) hour markers and hands are a bit yellow-ish, like patina. The lume of the dial is good and makes it a very readable dial in the dark. The hands are polished and contrast very well with the black lacquered dial, perfectly readable from all angles. What I also like about this watch is that it lacks all the needless information on the dial. Only the Longines brand name & logo and the fact that it is an automatic watch. All other information, like the water resistancy level, the reference number, the model name and the fact that it is Swiss made is on the case back. 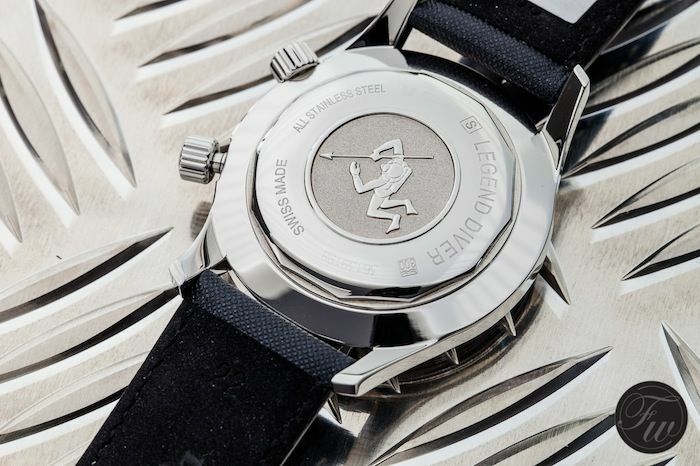 The center of the case back is an embossed emblem of a diver holding a harpoon. Longines is part of the Swatch Group and one of the advantages of being part of this group, is that you are able to use a movement from the ETA company. While other companies seem to be more concerned about developing in-house movements for marketing reasons than for the sake of creating cool watches, Longines picked the ETA2824-2 for their Legend Diver Date. I really don’t believe that an in-house developed movement is that important for customers. I believe a reasonable price for a watch is more important than the origin of a movement. I’ve seen other companies double the price for the exact same watch, but now featuring an in-house movement. That doesn’t make sense to me. Also, the ETA 2824-2 (like many other ETA movements) have a perfect track record of being a solid and accurate movement. And the previous paragraph brings us to the price of the watch. Just like the Longines Saint-Imier Retrograde Moon Phases (read my review on it here), the price is a very competitive aspect of this watch. 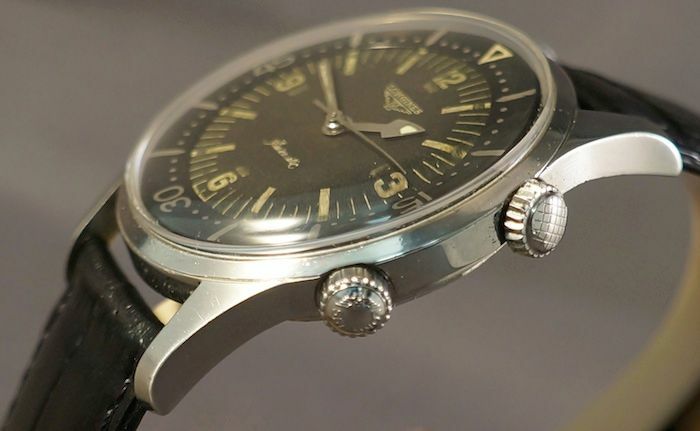 This Longines Legend Diver Date has a retail price of 1540 EUR (in The Netherlands, including 21% VAT). At first, I couldn’t believe that this is the actual price tag. It is very (very!) competitive to a lot of other watches out there. For this kind of money, you are probably able to buy something nice and vintage from a lot of other brands, but there are always a number of things to consider (possibility of expensive repair or maintenance costs, very small diameter) when doing that. If you don’t want to think or care about these aspects and just want a cool modern watch (with interesting heritage), this Longines Legend Diver Date might do the trick for you.